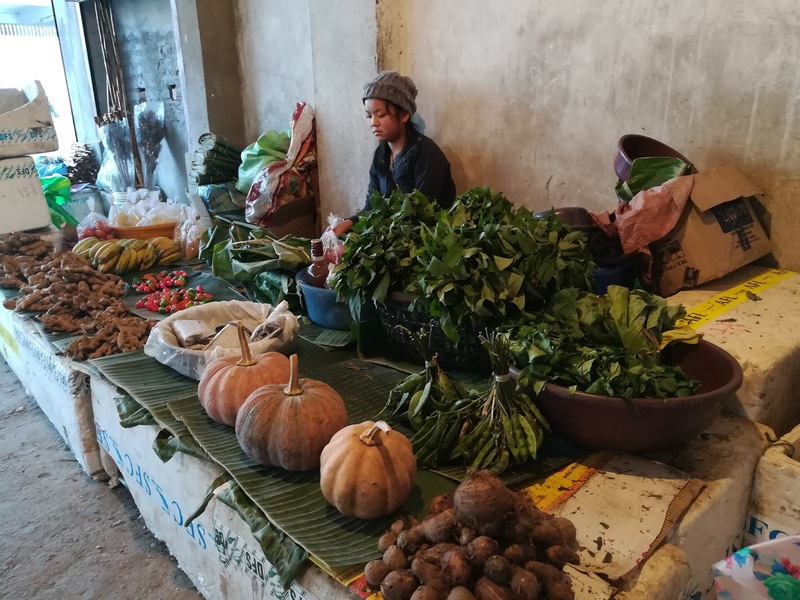 A woman sells organic garlic, ginger, kiwi fruits and yam by a sidewalk in Kohima. Nagaland is home to a wide variety of flora and fauna, and they somehow, famously make it to the dinner table. 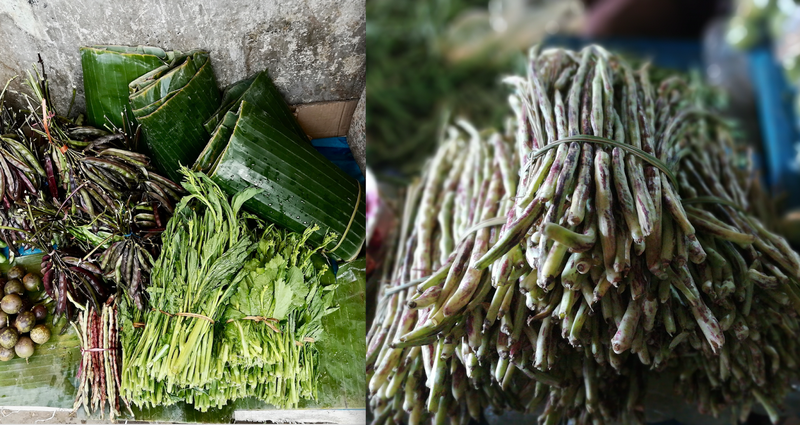 Since people highlight the non vegetarian aspect of Naga cuisine often, I am going the vegetarian route in this post. It is undeniable that Nagas love their meat but each Naga meal has a lot of greens as accompaniment. Primarily rice eaters, dishes vary from house to house with each kitchen dishing out both vegetarian and non vegetarian delights using the available ingredients. Dishes are simple stews. Vegetables are boiled, steamed or sautéed and seasoned with salt, chilli, ginger, garlic or typical Naga flavours such as Sichuan pepper, fermented soybean paste or bamboo shoot juice, salt brine etc. 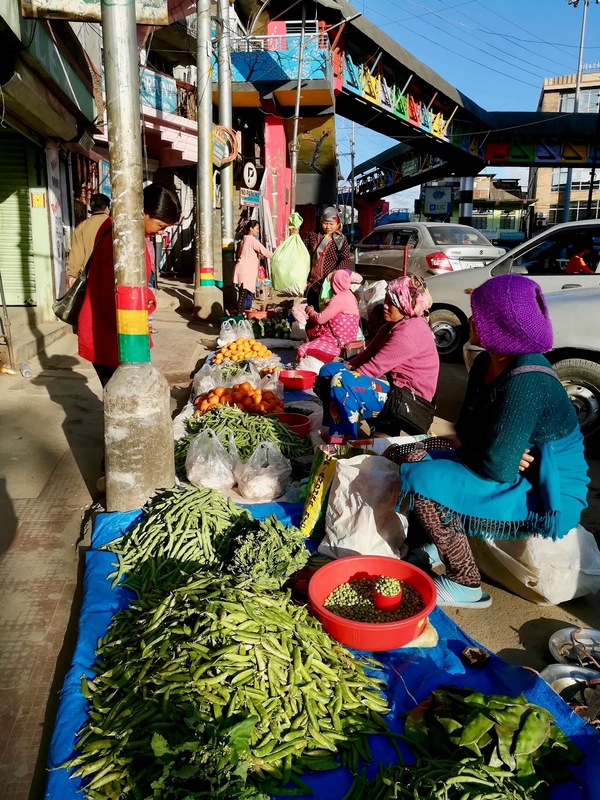 Mother says it is best to eat what is seasonally available and here are a few images of the winter veggies in Kohima. 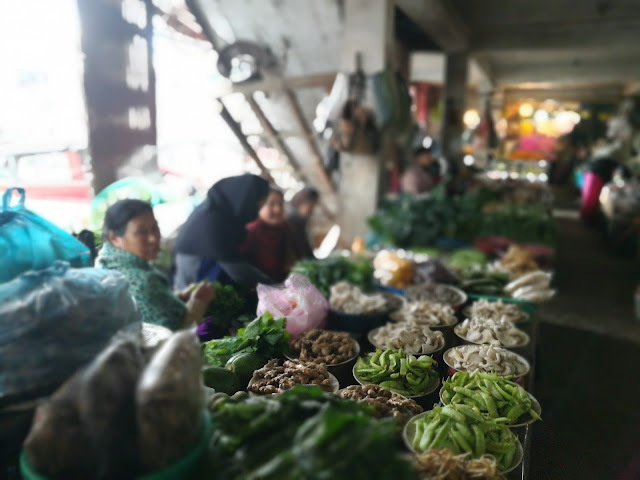 A round at the local vegetable markets that sprout up everyday would yield an interesting mix of seasonal vegetables and fruits. 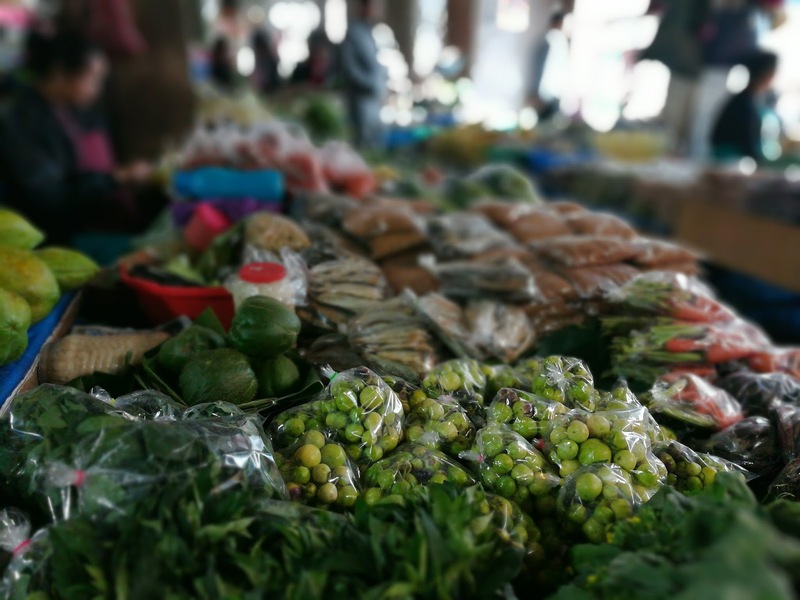 I love to walk around town and visit the markets to pick up my grocery. The colours, scents and unique flavours always remind me how blessed I am to live and eat in an organic produce paradise. 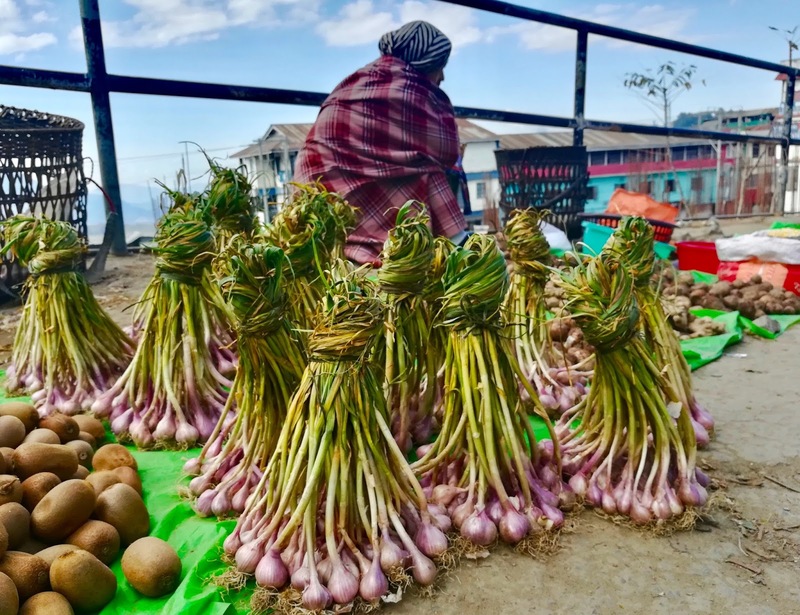 Mother says it is best to eat what is seasonally available and here are a few images of the winter veggies in Kohima. Garlic, spring onion, beans, eggplant, peas, corn, pumpkin, squash, gourds, lentils, rice, cucumber and all types of local greens, fruits, tomatoes, dried vegetables - all fertiliser free produce - make an appearance. 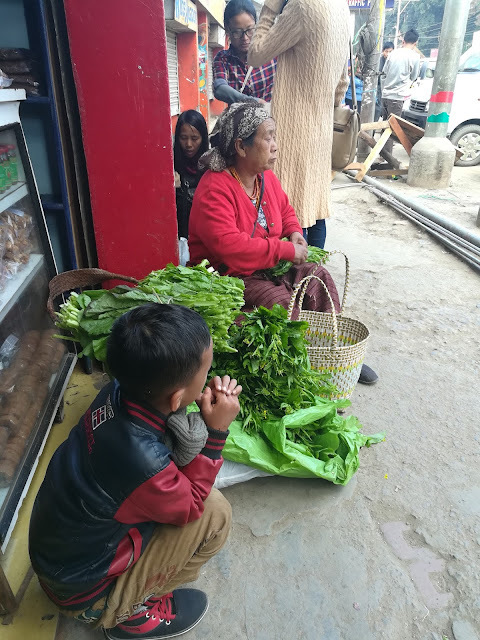 Little boys gives Grandma company as she prepares bundles of Mustard Leaves for sale. 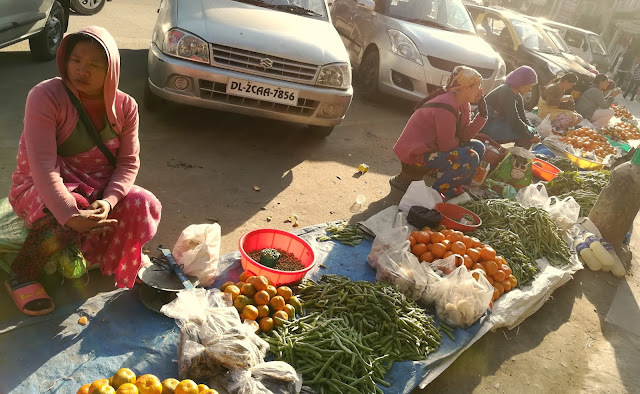 You would also notice from the shots that it is mostly women selling their goods at the market. I love to chit chat and haggle with them while deciding what to get home. It is not surprising that I often end up buying too much. It’s an organic veggie heaven for veggie lovers. 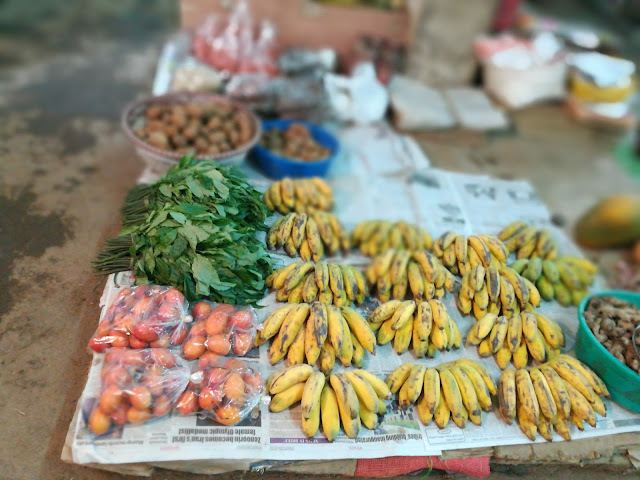 There are permanent markets and pop up markets on the sidewalks. 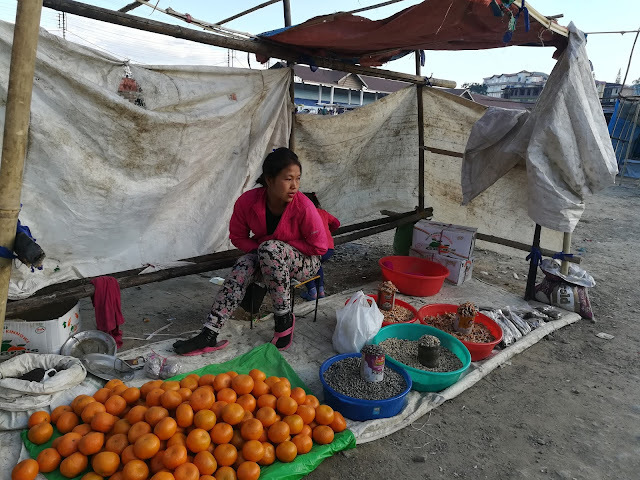 The ladies with a permanent spot in the Market shelters pay a monthly rent. 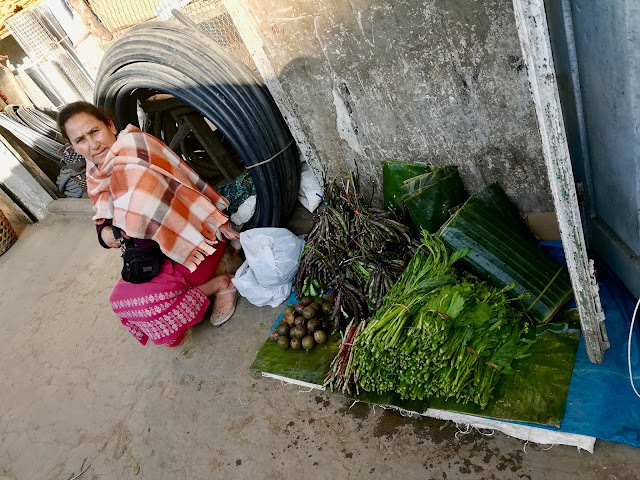 While the hawker ladies have to pay for a permit daily and often have to seek shelter nearby when it rains as they sell their goods out in the open on a strip of plastic sheet after bringing their goods in a traditional cane basket. Some sell their goods out of the boot of a parked car. Others sit under a temporary tarpaulin. Goods are divided into standard portions and some sold by the kilo. 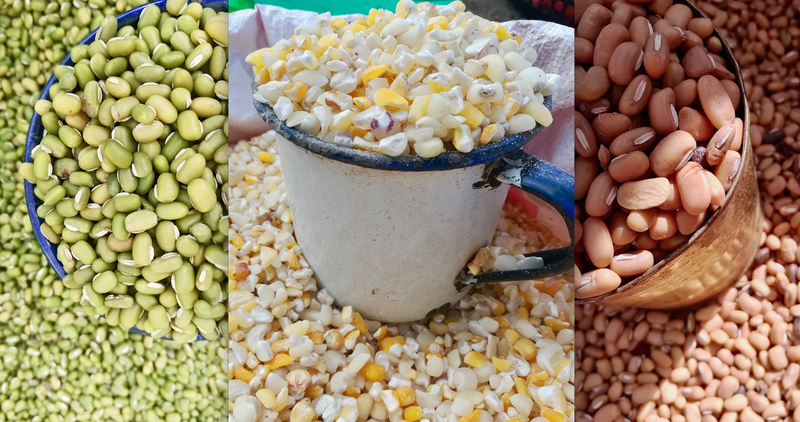 Prices range from 10 rupees a bundle to 80 rupees for a kilo depending on the item. 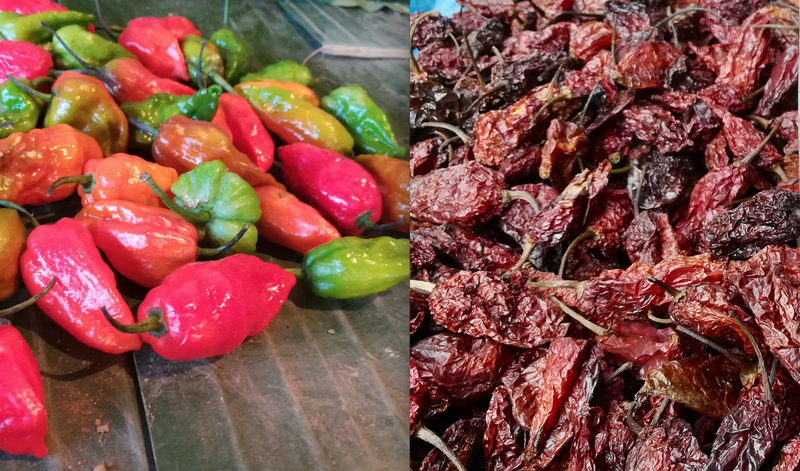 Fresh Raja Mircha/King Chilli and Sundried ones. 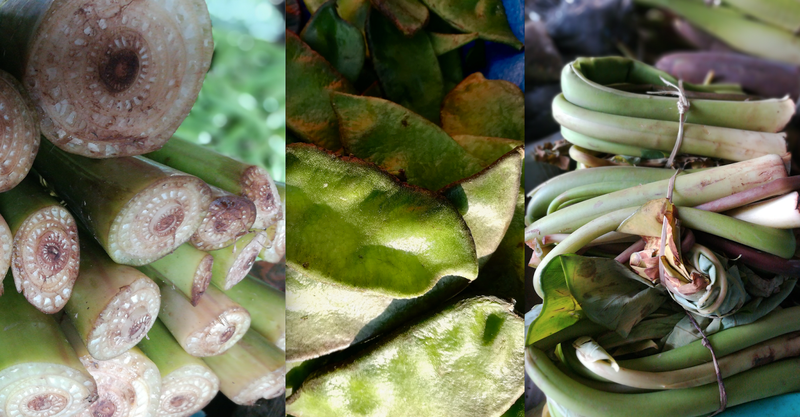 Banana trunk, Peas and Yam leaves. 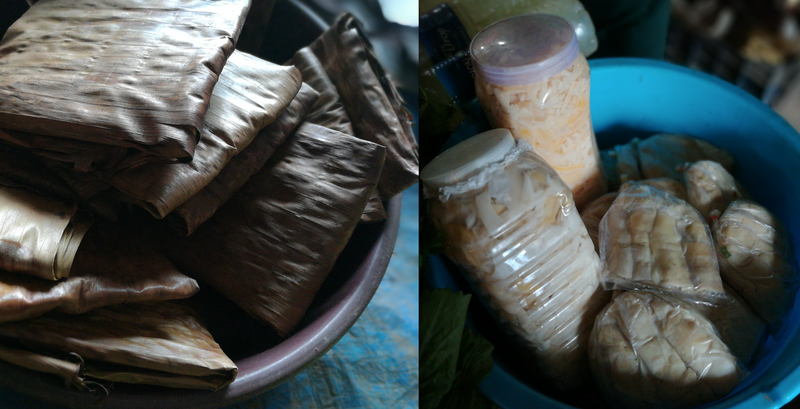 Fermented Soyabean cakes wrapped with banana leaves and fermented Bamboo shoots. 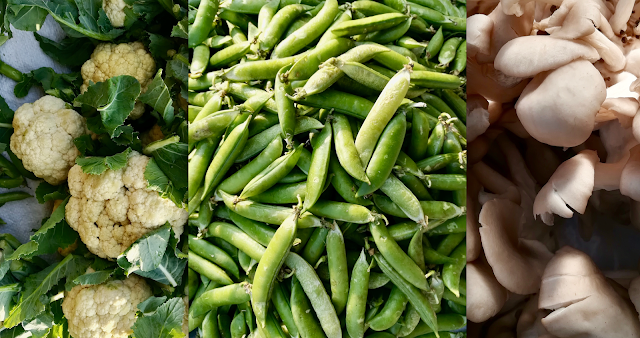 Beans, Banana leaves, Mustard leaves, Peas and Passion fruit. The happy ladies tell me that they bring organic products from their own gardens, while some buy in bulk from other farmers and sell them for a slim profit. From morning to dusk, they sit in their spots and hawk. 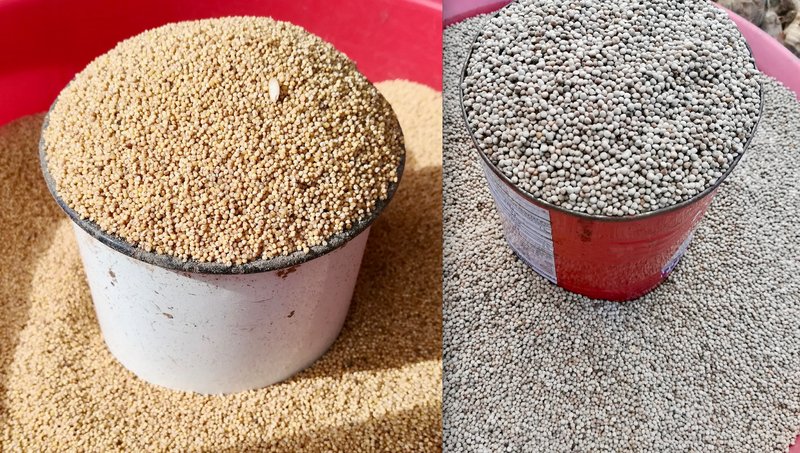 The unsold leftovers get distributed among family and neighbours as most goods are easily perishable. 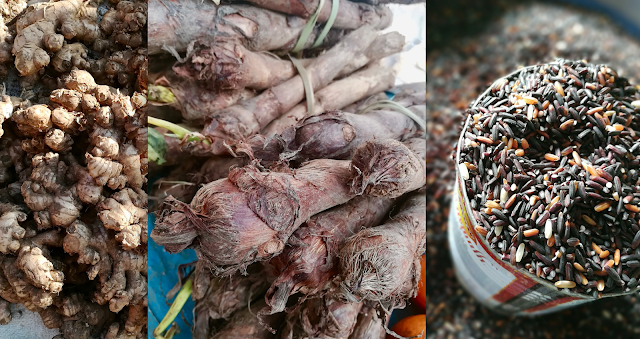 Ginger, Colocasia and Black rice. Tree tomatoes, Lemons and Oranges. And sometimes, late evening shoppers like me get to take home generous bundles of fresh produce for a super paltry sum or even for free at the end of the day. Thank you Veggie Aunties for letting me take the many pictures and telling me your stories. Shot in Kohima with upcoming @hihonorindia phone.